There is nothing worse than waking up in the morning to dark, puffy eyes. Your skin has time to regenerate and reinvigorate itself overnight, but this is also the time that can cause unsightly eyes. Since your eyes are pivotal to your overall appearance, you should take extra steps to ensure that they are clear and bright everyday. Reducing puffiness and dark circles can make you look younger and more alert. By using a combination of OROGOLD skin care products and making other healthy decisions, you can have bright and youthful looking eyes. 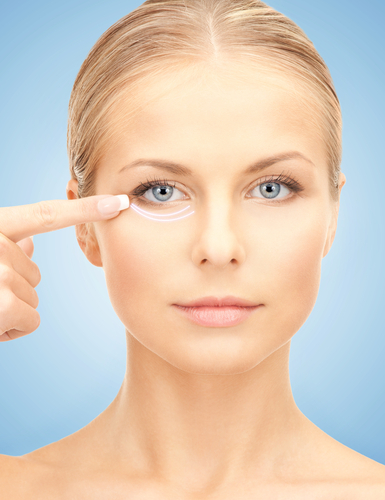 What Causes Puffiness and Dark Circles? The skin under the eye is very thin which causes it to be easily influenced by the amount of fluid in your system. Fluid in your body will travel from places with a low concentration of salt to places with a high concentration of salt. This is why the morning after a salty dinner or watching a tear-inducing chick flick your eyes can look swollen and puffy. Puffiness and bags can also occur if you sleep on your stomach. When you sleep on your stomach, gravity causes fluid to pool under the eyes. If you change the way you sleep and work with gravity instead of against it, you could eliminate the bags. Simply not getting enough sleep can cause your eyes to puff too. Sleep is important to your overall health, not just your cosmetic health. Dark circles are caused by a number of factors as well. First, they could be genetic. You have inherited pigmentation issues from your genealogy. If this is the case, as the skin ages it also thins to reveal the small blood vessels just below the surface. The number one cause for dark circles is the loss of volume due to age. Unfortunately, the eyes are one of the first areas on your face to show the signs of aging. The loss of volume creates a hollow space which can look dark relative to the rest of your face. Some simple lifestyle changes can actually have a big impact on the condition of your eyes, so try these first before rushing out to buy the latest new beauty product. First, get enough sleep. This point really cannot be stressed enough. Cutting down on your salt and alcohol intake, especially late in the evening, will reduce the chances of waking up with puffy eyes. And smoking can be devastating for the condition of your eyes in more ways than one, so quitting completely is the best option. If you do wake up with puffy eyes, placing cold spoons or slices of cucumbers on your eyes will contract vessels and reduce swelling. Use a high quality product like Oro Gold eye serum nightly, as well as a moisturizer. This will reduce puffiness, dark circles, and also fine lines and wrinkles. And if all else fails, a good concealer can go a long way. These tips paired with Vitamin enriched skin care products from Oro Gold will help you wake up looking refreshed and ready to go.